When it comes to fencing Springfield, IL residents choose Hohulin Fence. 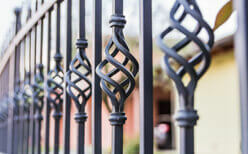 Since 1897, Hohulin has offered Springfield, IL beautiful, durable fencing, gate and railing products. It seems like Hohulin is the most trusted name for all of your residential and commercial needs. In addition, your business can count on us as well! Hohulin Fence supports businesses in Springfield by providing high-quality fencing, gate and railing products to our valued customers. In conclusion, for fencing Springfield, IL trusts the reliable name in fencing. They trust Hohulin Fence. Call us at 309-316-1008 or contact us online today!